I’m trying to catalog View-ViewModel Binding Patterns so that I can compare their strengths and weaknesses. So far I can think of 2 basic ones. The names I gave them are made up. What are the others? Description: The View directly instantiates the ViewModel and assigns it to the data context. Pros: Easy to set up and get going. Easy to add design-time data. Cons: Requires default constructor on ViewModel. This makes Dependency Injection scenarios difficult. 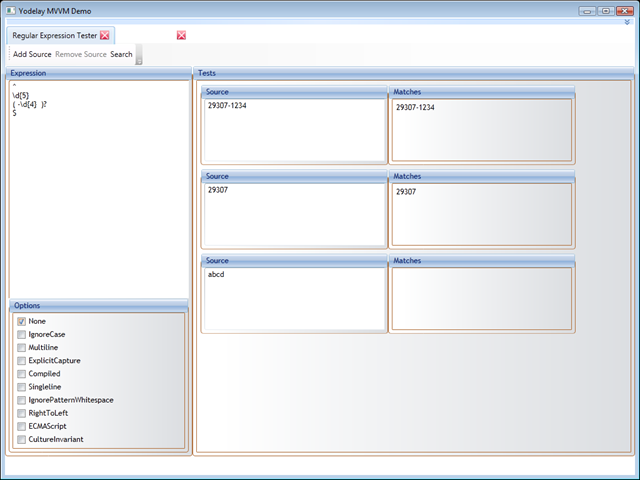 Description: The View is chosen by a data template associated with the ViewModel type. Pros: ViewModels fit easily into Dependency Injection scenarios. Cons: Design-time data is more difficult to accommodate. Tooling cannot tell the type of the ViewModel associated to the View during View development. Yodelay has been updated. I’ve modified the Regular Expression tester so that it supports n-number of test contexts with a single expression. In addition, you can search regexlib.com for a useful expression. This screen is fully implemented using MVVM. 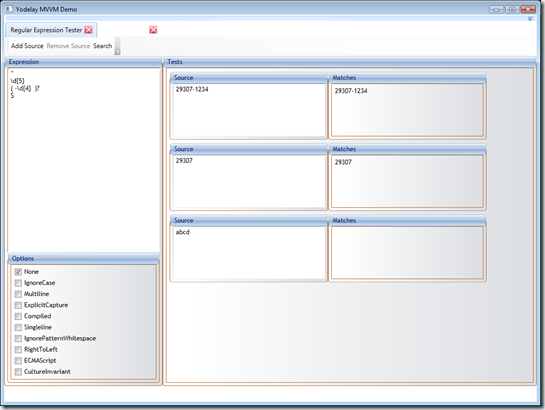 The search window serves as an example of using MVVM with dialogs. I’ve also pulled in the themes from WpfThemes and integrated the ThemeManager.